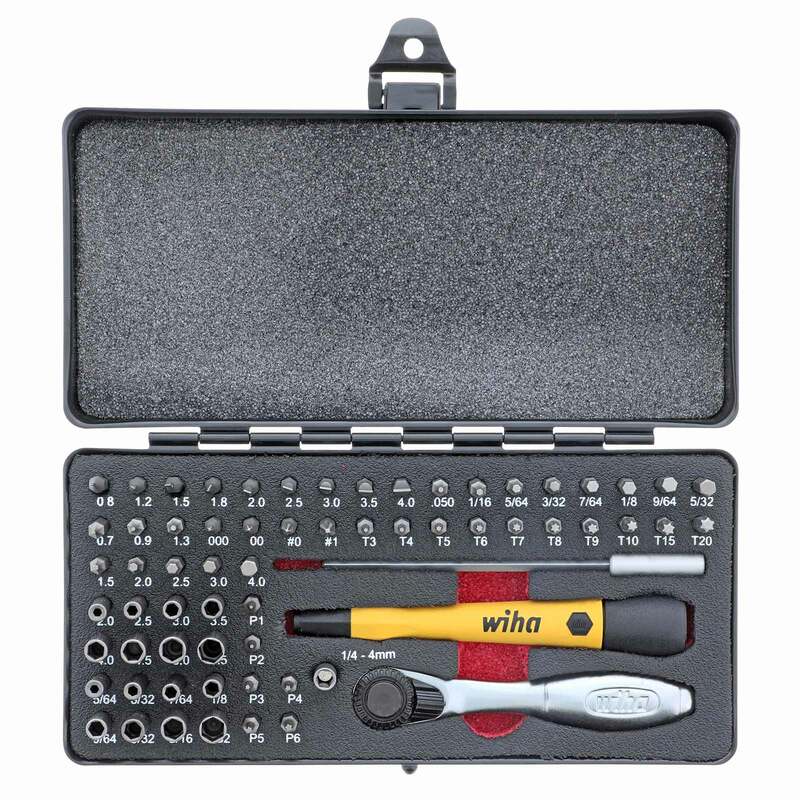 This impressive Micro-Bit ratchet set by Wiha is everything you have come to expect from the acclaimed German manufacturer. Each component is overbuilt and precision-crafted. The ergonomic 72-tooth reversible mini ratchet is drop-forged. The bits are constructed of Wiha's special chrome-vanadium-molybdenum tool steel. The 5 inch speed-handle with rotating end cap is made of high-quality cadmium-free plastic. This is quite honestly one of the nicest sets we’ve ever seen. Bit profiles include: Slotted: .8, 1.2, 1.5, 1.8, 2.0, 2.5, 3.0, 3.5, 4.0 mm; Phillips: #000, #00, #0, #1; Hex metric: .7, .9, 1.35, 1.5, 2.0, 2.5, 3.0, 4.0 mm; Hex inch: .050, 1/16, 5/64, 3/32, 7/64, 1/8, 9/64, 5/32; Torx: T3, T4, T5, T6, T7, T8, T9, T10, T15, T20; Nut driver, inch: 5/64, 3/32, 7/64, 1/8, 9/64, 5/32, 3/16, 7/32; Nut driver, metric: 2.0, 2.5, 3.0, 3.5, 4.0, 4.5, 5.0, 5.5 mm; Pentalobe (for Apple products): PL1, PL2, PL3, PL4, PL5, PL6. Includes deluxe fitted organizer/case.